Over February half term I decided to make a baby quilt, well more like a throw. I made it as a gift to my form tutor, as his partner has just had a baby. He’s also been my form tutor for the last five years so it’s also as a thank you gift. 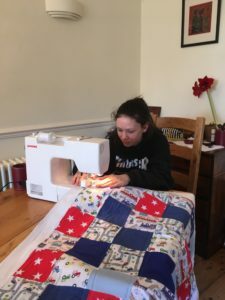 I go to sewing classes with Gill Towell of Gillymac Designs where I have made three different and unique quilts. We have also entered two quilts as a group for the National Festival of Quilts. We came 2nd with one and got highly commended in the other. 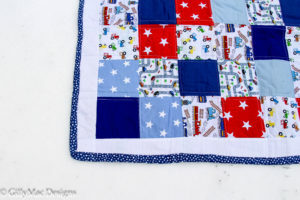 I started by looking for fabric suitable for baby boys and found that there were lots. 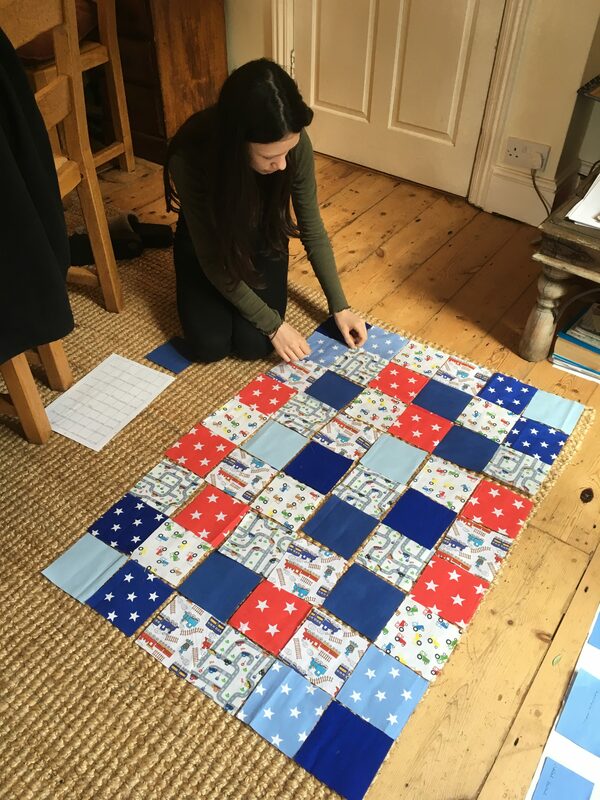 I then had to work out what size I needed and how many squares I needed. I bought a fat quarter bundle which came with 5 different materials. 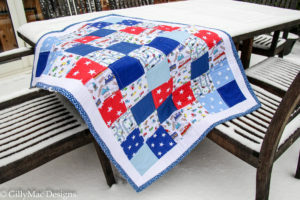 As I was short of a few squares, I bought another bundle which I thought has colours in it which would bring all the fabric together – which indeed it did! I started off by drawing out my pattern and seeing which patterns would work well together. I then assembled it by making blocks of 9, 3 across 3 down. I decided to have 6 squares going across by 9 squares down. 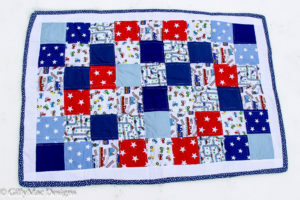 Once I had made the patchwork top centre, I added the borders which I decided to have white so that it would accentuate all of the colours in the main panel. After that, I glued it to the backing using temporary glue. 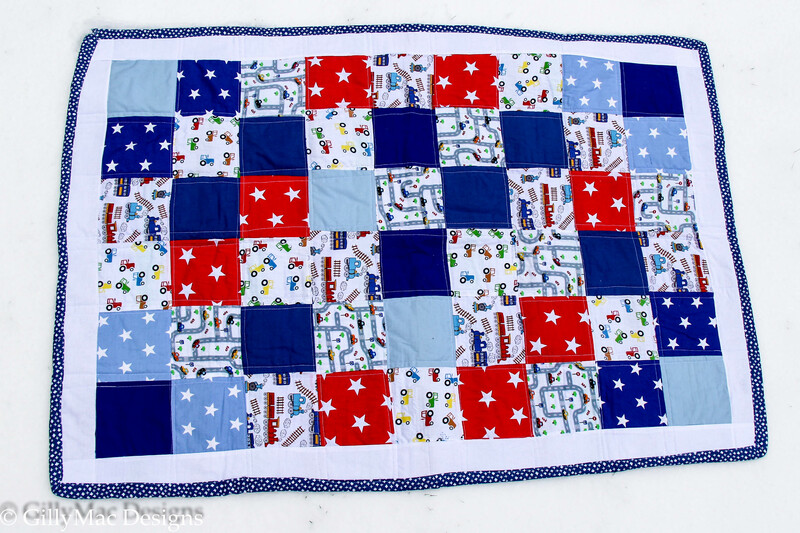 I then quilted the whole thing using a walking foot creating a grid design. 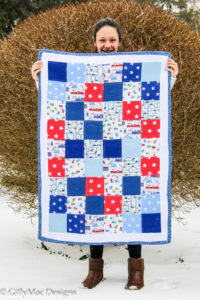 I finished the quilt by making my own binding and sewing it around the edge. This gave the quilt a nice finish and made the whole thing come together. The most challenging bit was adding the binding and trying to make it look neat at the corners. I also found matching the fabrics and making it look nice was quite difficult and took a long time. My favourite part of the quilt is how it all comes together and how the colours work well. I like how the binding finishes the edges and how it brings it all together. I would definitely make it again as I had so much fun making it. 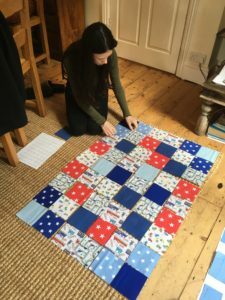 There is so much effort and concentration involved and I have learnt so much from doing it. I would do it the same way because it’s a great design and I like the way in which it turned out. I am giving it away sometime next week before my form tutor goes on paternity leave.